Google's MBTA trip planner now includes real-time data, not just schedules. Boston’s MBTA has a different perspective on data-sharing. The agency doesn’t even show real-time tracking on its website – instead it links to an App Showcase of third-party software developers that have created tracking tools on their own. There are now more than 30 third-party apps that connect T riders with real-time tracking data – all at no cost to the MBTA. Robin says people almost always get traffic and weather information from a third party like news radio. He sees transit data the same way. It also took a little more elbow grease. While the T always works closely with its app developers, it had to put in some significant programming work to get the data to match Google’s system. 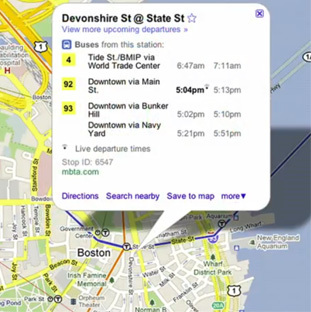 Google came up with a standard format for all of the agencies’ real-time transit data. The company took its data format, called GTFS, or General Transit Feed Specification, which has become the “de facto standard” for schedule information, according to Robin, and modified it for real-time tracking. The T was already using GTFS for schedule information but had some re-programming to do to put the tracking data in that format. Besides Boston and Portland, San Diego, San Francisco, Madrid and Turin were part of Google’s initial rollout of real-time tracking data. Public agencies don’t always understand that avoiding costs has the same impact as making money. Let’s not forget New York whose entire real-time prediction system is based upon open source software. Their API is based on an open standard named SIRI. ‘Course the MTA will charge you an arm and a leg to use their logo, and will happily sue other transit agencies over similar signage. It’s a shame Google didn’t work with New York, as support for that API would also yield support for other agencies across the globe. What’s also interesting to me, at least, is that Google chose to work with BART for San Francisco data. BART uses its own homebrewed, non-standard, awkward API. OTOH, Muni and AC Transit use NextBus just like Boston’s MBTA. Surely, there’d’ve been more coverage across the Bay Area if they hadn’t chosen BART first. Then again while Boston has this lofty goal of allowing developers to do all the legwork, they really don’t make /that/ much effort. Try finding a list of route names in either the NextBus feed or the GTFS files. When is the rollout for SF? Transit trip planning on Google Maps is quirky and sometimes the departure times are way off. NextBus is pretty good but having a map of the transit route is ideal. There’s some interesting articles about Muni performance on http://www.resetsanfrancisco.org. What is your thought on uers surrendering their privacy data in order to use Google Map on smart phone? Should transit agencies provide more content (i.e. real time transit data) to Google to build a better “mouse trap”? Open Source Development is a perfect example for an alternative to pay expensive software licenses. However, the real “cost” for today’s software is no longer money but personal privacy. What is the alternative? And transit agencies get sued, apparently.